* For my mommy to come back that will be the greatest gift of all. 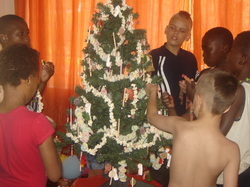 Last year we were able to fill most of the children’s Christmas wishes, please help us to fill the wishes again this year, the gift and Christmas meal you are sponsoring will be the only gift they will receive this year these children have already missed the chance this year to receive a cake or a gift on their birthday let’s not make them miss out on Christmas as well, we can make it possible to give them smiles again. YOU CAN MAKE THIS A CHRISTMAS TO REMEMBER There is so many children when they go to bed hungry that ask themselves “ why me what have I done”, it is difficult for children to keep their faith strong and to keep on trying. We have the power to change this by showing them a little bit of love and understanding, there is a candle burning in every soul and we need to keep that candle burning.